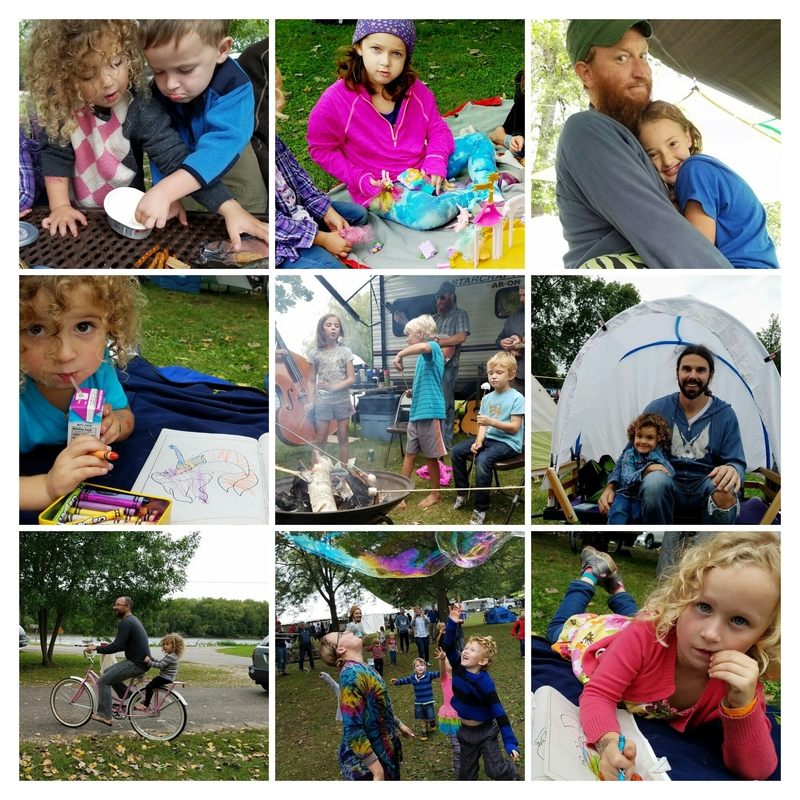 A magical bliss bubble encircles Boats and Bluegrass Festival and all its happy campers. We look forward to it all year long. This year, like all others, was epic. Ed was Master of Ceremonies for the festival, Ryan and I played photo-journalists throughout the weekend, and we helped out at the Happy Jangles booth where Angie was busy glitter tattooing as fast as she could. Boats and Bluegrass has become our family reunion festival. We all get our tickets as soon as they go on sale and then we are giddy with anticipation all year long. We enjoy lots of other music and festivals throughout the year, but there’s just something undeniably special about this one. I count 32 here and we were missing at least a few! When the big week finally arrived this year, storms and steady rains covered most of the country and there were regular flash floods along the Mississippi and most other rivers in Minnesota and Wisconsin. My friend Jill and I drove through crazy storms Wednesday night to find my family with our friends enjoying a lovely evening at camp with no rain. It hadn’t rained there all day and wouldn’t for most of the festival. Besides a couple of late night showers, enormous storms passed north and south of us all weekend – clearly unable to penetrate the growing Boats and Bluegrass bliss bubble. Plus, the threat of rain inspired the biggest and bestest tarp city to date. It was more of a tarptopia, really. Apparently, Ryan and Jay spent hours on Wednesday hanging every tarp we own. Then, each day, as more families arrived, each one came bearing gifts of more tarps. And, the kids – well, they have the time of their lives. They run in packs, barefoot, dirty, and free. There is nothing they like better than being somewhere adults are playing too. They run wild between the playground and camp, stopping only for periodic feeding frenzies and late night bed times. 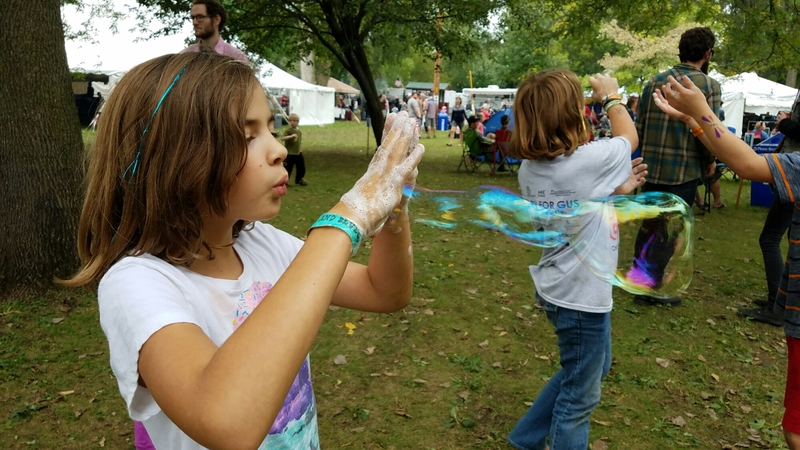 At the festival, there are “shows” with fire dancers,”Dangerous Fun,” and hands-on mega bubbles. 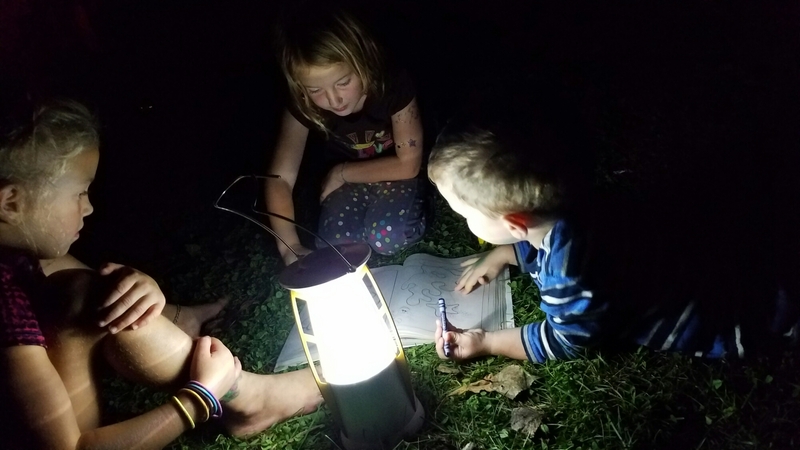 This year, we also noticed a company called Seekers Wild doing short day camp sessions for youth that get them involved in outdoor activities and shenanigans while their parents enjoy some peace and freaking quiet for once. Or, a peaceful paddle, music, or what have you. I love this idea – it’s brilliant! Our kids were too young, but the bigger kids went for a session (about 3 hours) and LOVED it. One of the Dads who dropped the kids off relayed that a skeptical boy in the group asked the trip leader what they were going to do. The guy rubbed his beard, scratched his belly, and nonchalantly replied, “Well, how bout we go get into some trouble? !” The boys, and the Dad, were all in. So what is it that makes this festie the bestie? (Sorry, I couldn’t stop myself.) It’s kind of the whole package. It’s great music in a beautiful place with all your favorite people. 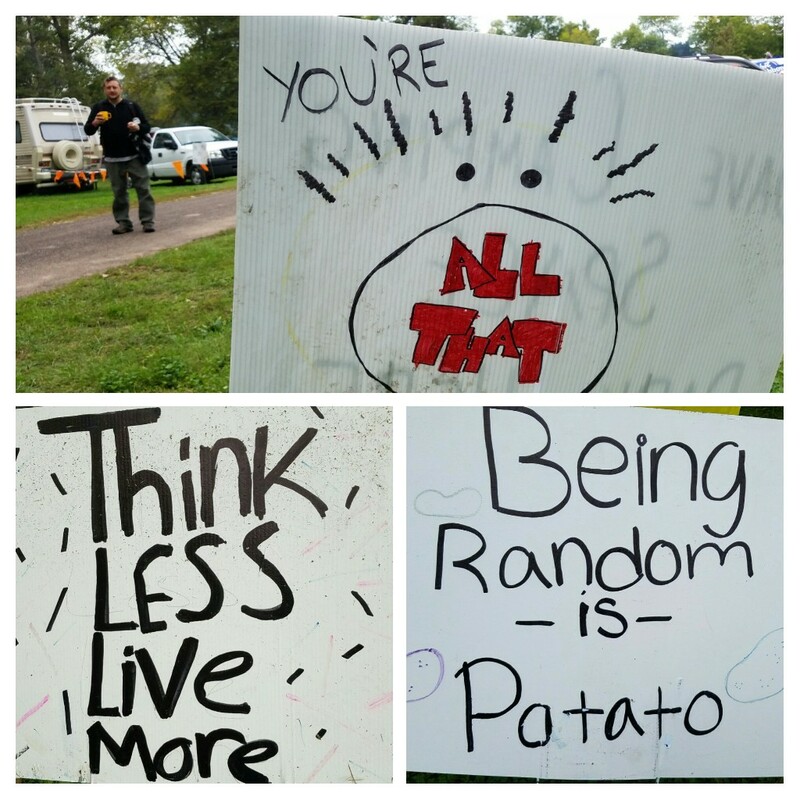 It’s happy people all around you, and seriously silly fun. It’s a playground for grown-ups and kids that’s lit by laughter, stage lights, and dreamy campground jams. It’s boats, bluegrass, and an all around bliss bubble. And, it should come as no surprise, that it’s all thanks to the vision and planning of the sweetest little family you could ever know. Musically, Boats is always a stellar blend of old favorites and new finds.We’ve “discovered” some of our favorite new-to-us bands here: like Shook Twins, Paper Bird, and this year, Jon Stickley Trio. 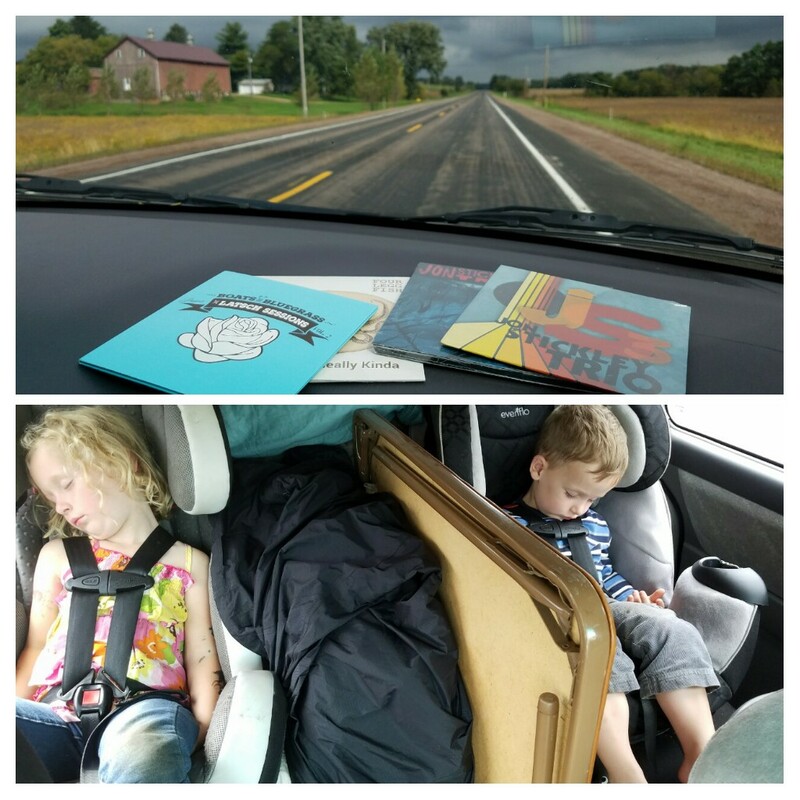 A few years ago, we heard Shook Twins for the first time and went home with a couple of CDs we listened to as a staple throughout the year. Last year,the Shook Twins dedicated a song named “Jesse” to me during their late night set after a request from my sweet quy. Seriously, I can’t make this stuff up. We’ve seen our friends play here and we know how much fun they’ve had. Bands like Trampled by Turtles grew up on this stage, and have since outgrown it. Some of the guys and sometimes the whole band show up for surprise appearances, but they’ve become “too big” for the official lineup at this small family festival on the Mississippi. Eddie Danger interviewed members of Trampled by Turtles before their surprise set at Boats and Bluegrass 2015. We’ve also enjoyed favorites from our hometown area, like Eddie Danger, Sloppy Joe, Rachel Hanson, Dead Horses, and Horseshoes and Handgrenades. Ryan has played here with Ed in at least three of his bands (Dangergrass, Canon Ball, and Eddie Danger and friends) over the years. This year, I didn’t even look at the lineup before we went. Most of us didn’t. We knew it would be great and we were too busy getting excited to care about the details. Okay, Ryan would want me to note here that HE knew the lineup and everything about everything since that’s how he rolls. Weeks and then days beforehand, he came to me, perplexed, noting that Jacob Jolliff was listed as an artist on the website but not mentioned in the advertised lineup. He was not at all surprised to see Jolliff sit in throughout the weekend:) We’d just missed getting to see a house concert he played at a friend’s place outside Portland, so this was another special piece of festival magic for us. Of course, since we have a 3 and 4 year old, we spend a lot of time at camp. Each year has gotten a little easier as our kids have grown older and more families have joined the festivities. The benefits of group parenting cannot be overstated. If only for a long weekend, we are fully immersed in the Boats and Bluegrass Bliss Bubble and we become a village of high-functioning community chaos and camaraderie. Until next year, friends!